Richard Griffin has been at it again. 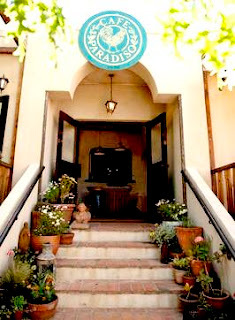 He has made Café Paradiso at 110 Kloof Street, Cape Town, his own. This rather cranky old lady has been refreshed, refurbished, revamped and revitalised and under the unique Griffin imprint has become a special place again. Over two decades ago, Frieda found this lovely old house and converted it into one of the most popular restaurants on the slopes of Table Mountain. Serving Mediterranean food, she attracted people from far and wide eager to savour the delights that emerged from her kitchen. Frieda eventually moved on and the house played host to a series of restaurateurs. 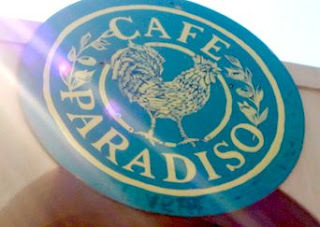 The name became and has remained Café Paradiso and Richard Griffin, as is his wont, has kept the old established name. Entering the garden of Cafe Paradiso, one leaves the bustle of Kloof Street behind. 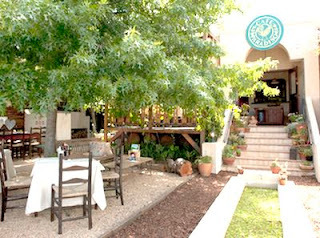 Tables are set under the trees and the shade is a haven for the hot and weary traveller. Ahead is an oblong water feature and fountain and beyond that are the steps leading up to the double doors of the restaurant. Potted plants line the steps and at the top, a winged sphinx- like creature keeps guard. The interior is cool with tiled floors, high ceilings and deep-set wood-framed windows. Tables are set with linen cloths and attended by beautiful and comfortable Globe chairs which are 1980's restaurant chairs. Seed cloth curtains and roughly painted walls complete the picture. 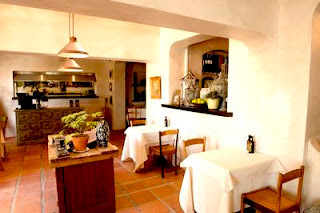 To the right of the entrance one can glimpse the kitchen with the cooking staff beavering away. This was the old smoking section of the restaurant. We chose to sit indoors at a table near an open door. Menus were swiftly delivered and drinks offered. The waiting staff displays all the friendliness and food knowledge that we have come to expect from Richard Griffin's establishments. The menu is printed on an A4 sheet of white paper with the wine list on the back. 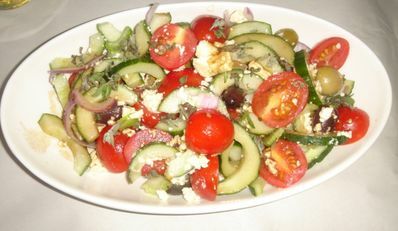 As it was an exceptionally hot, burny day, I thought that a salad would be perfect and chose the 'Classic Greek Salad with tomato, cucumber, olive oil, balsamic and origanum'. Eugene ordered 'Charred Lemon and Rosemary Chicken', one of the specialties of the house. To wash it all down, a Peroni beer for Eugene and a large jug of water with ice for me. While we waited for our food, we took the opportunity to explore. A newly constructed wall separates a bar area from the main body of the restaurant. The rustic bar counter is made from unplastered bricks and has a shiny wooden top. Opposite is a beautiful, 200 year old wooden cupboard displaying special vintages. Towards the rear of the restaurant we found the bakery. The legend printed on the menu declares that 'the kitchen is open from 8am to 10pm, six and a half days a week and the bakery never sleeps' Well now, isn't that something? The bakery caters for all the restaurants requirements; excellent breads, delicious cakes, pastries and croissants, all freshly made to be eaten on the day. In a room off the bakery, we spotted strings of homemade pasta hanging from ceiling racks to dry. The manageress, Christina Koen, proudly told me that the restaurant endeavours to produce whatever it can on the premises. Even the butter is homemade and there is a beautiful old wooden butter churn doing sterling work. Birdcages filled with weird and wonderful things are a decorating feature of the Griffin restaurants, so we were highly amused to come upon a birdcage that actually housed a bird! Our food had arrived and we tucked in with gusto. My Greek salad was crisp, crunchy and delicious. Eugene's chicken was tender, beautifully cooked with a subtle lemony flavour. I shall order it when next we visit Paradiso. There are Mediterranean style meat and vegetable antipasti offerings, also interesting and exotic starters such as mussels, black risotto with chorizo, salt and pepper squid and a selection of delectable salads. Portions are generous at Café Paradiso, so any of these choices would satisfy as a main course. Breakfast, which is served till 12 noon, includes slow baked wheat-free muesli, grilled cornbread with churned butter, buttermilk flapjacks, all sorts of egg combinations, savoury french toast with grilled haloumi, oh yum, and much more. There is also a selection of sandwiches. Vegetarians are generously catered for in the 'Pasta and Risotto' section and for the dedicated carnivores there is plenty in the 'Mains' section. Try the Panned Rack of Veal Stuffed with Four Cheeses, Coppa and Prosciutto served with Chunky Tomato Salsa, or Organic Sirloin with Black Mushroom or perhaps the Linefish of the Day. So many choices, so many dilemmas. There is a special 'Kids' section on the menu and best of all, there is a wonderful facility to keep these young gourmandes and future discerning diners occupied. A very special lady, Maria, entertains them. There is a section in the bakery where, if they wish, they are taught to make their own pizzas or bread or cupcakes or even a gingerbread man. But there is more. Maria reads to them or they all might go around watering the plants together. What a lovely adventure! 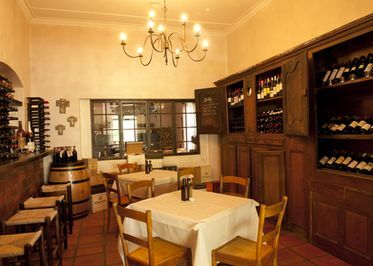 The Executive Chef, Heinrich Koen, has been part of the Zingara family for quite a while. He and the manageress, Christina, met and married whilst working for Richard Griffin. This dynamic young couple bring energy and zest to the projects with which they have been involved. 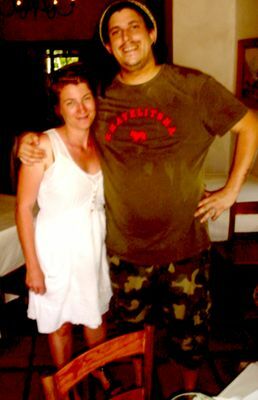 Christina, who studied graphic design, has been project manager in the styling and interior design of many of the restaurants and Heinrich has been responsible for the food styling and training of staff. He is passionate about food, having worked abroad and studied with Jamie Oliver and Aldo Zille. Their son, Alexander, whose name is emblazoned on Heinrich's arm, is 2 years old and somehow fits into this extremely busy and modern couple's life. They happily work 7 days a week. Richard Griffin describes Café Paradiso as a 'permanent base for some of our older staff - those for whom touring has become tricky because they now have cats and dogs and families'. So in keeping with the ethos of Paradiso, bring your children, your pets or just come with someone you love. Booking for dinner is essential.